Thought leadership is an enterprise, powered on the wheels of thoughts for the advancement of humanity. It's a role for those with a heightened awareness of their divinity. Thought leaders are people who deeply understand the business they're in. By business, I mean an enterprise ( a vehicle of conveyance) that sells an ideology which changes the face of humanity. If you've got unique insights to share, if you've internalised lessons that can be translated into your own relatable experience, then you're a thought leader. Thought leaders package ideas in formats to change the way people think. They're not only talking, they're doing things and teaching others how to do it. When you figure out how to solve a problem and teach others how to solve their own problems, you're a thought leader. The beautiful thing is that as a thought leader, you’re viewed as a divine being by many. It’s a beautiful place to be and function. I've led many on the paths of expertise in writing and thought leadership based on this principle of divinity, not because of certification (the heck, I've got just my B.Eng in Mechanical Engineering), but because of the value my divinity embodies. Here's the beauty. When you're a thought leader, it allows people to find you, it makes things happen. Ultimately, you"ll not wait around just to be picked, you lead a revolution. - EXPERIENCED something. Perhaps, you were raped and you’re now tinkering over how to stop rapes. Perhaps, you worked for 15 years in a bar. Now, you’re experienced in how to woo customers, dodge potbellied men who have lecherous fingers and imbibed a spirit of resilience. - KNOWLEDGE in an area. Perhaps, you’re a programmer, IT specialist, medical doctor or pastor. - EXPERTISE. By working as an accountant in an office, you’ve waded the waters of knowing how to salvage the accounts of a company and worked the books of the clients. - have a GIFT. Perhaps, like me, you’re a gifted writer. Maybe you’ve got the voice of a hummingbird or you can act. The tides have changed. Via the digital space, you can utilise these areas to build your own enterprise, gain recognition and earn profitably. That's why we want you to be at EXHUME! You'd be taught the basics of how to do this. Date : 22nd October, 2016. Time : 9 a.m. to 3 p.m.
Venue : No. 2 Oyefeso Avenue (road between Consolidated Hallmark Insurance and Fidson LImited) off Ikorodu Road, Obanikoro, Lagos. Entry is only available to 30 participants only. 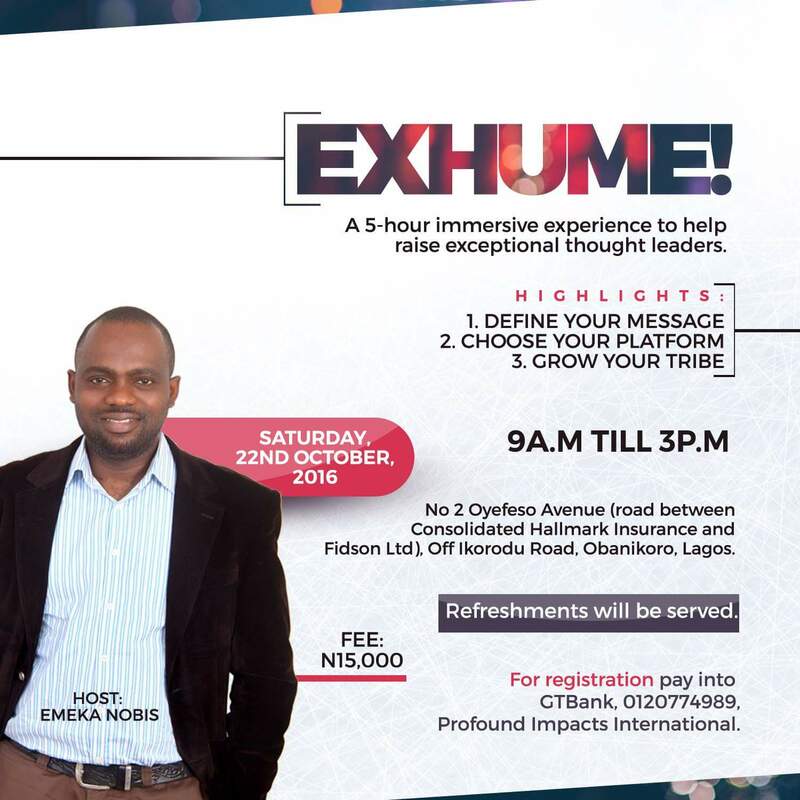 To register, please pay into GTBank, 0120774989, Profound Impacts International.